Showing Creek and Cherokee territory prior to the Trail of Tears. A beautiful example of Finley's important 1827 map of Alabama. Depicts the state with moderate detail in Finley's classic minimalist style. Shows river ways, roads, canals, and some topographical features. Offers color coding at the county level. 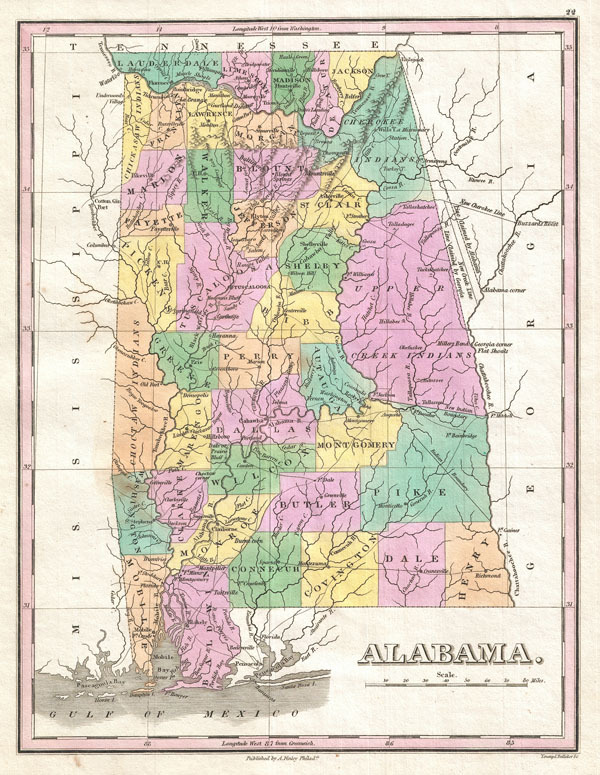 This map is also of interest as it details a territorial dispute between Alabama and Georgia. Early surveying errors attributed the same territory to both states. Shortly before this map was made, the territorial dispute was settled on behalf of Georgia. Title and scale in lower right quadrant. Engraved by Young and Delleker for the 1827 edition of Anthony Finley's General Atlas. Rumsey 0285.022 (1831 edition) Phillips (Atlases) 4314, 760, 752, 6045. Mason, Sara E., A List of Nineteenth Century Maps of the State of Alabama, 15.